MARTINS FERRY — Prior to selecting his roster for the OVAC Rudy Mumley All-Star Football Game, Ohio head coach Karl Justus spent a lot of time looking at film to get guys that would fit his spread system. He thinks he’s found the ideal pieces. Justus named his backfield candidates for the game, which is slated for the July 22 at Martins Ferry’s Dave Bruney Football Complex. The players will begin to learn the system on July 15 when they report to camp at Bethany College. As for the running backs, Ohio boasts a batch that contains speed and power, which was exactly what Justus sought. JESSE BALL, Harrison Central — This former Huskie shined on both sides of the ball for Coach Justin Kropka’s team last season. The 6-1, 245 pounder lined up at fullback and linebacker, posting more than 200 yards rushing and more than 100 receiving, while paving the way for the Huskies’ other backs. Defensively, he logged 112 tackles, including 25 for loss and five sacks. Ball was the Eastern District’s Co Defensive Player of the Year and earned first-team all-Ohio. He was also first-team all-OVAC. Ball, who plans to attend Theil University, is the son of Glen and Hellen Ball of Scio. ROBERT COPPA, Indian Creek — This former Redskin was a standout in the backfield for Coach Andrew Connor’s squad. The 5-9, 175 pounder scored 24 touchdowns, while accumulating 1,300 yards on the ground. He also caught passes that covered 300 yards during his career. Defensively, he recorded 248 tackles, forced four fumbles and recovered five. Coppa was twice named all-Eastern District and all-OVAC. He was also twice named all-Quad County. Along with athletics, Coppa is a member of the National Honor Society and Key Club. Robert, who is the son of Bob and Kelli Coppa of Wintersville, plans to attend John Carroll University. CASEY LEWIS, Fort Frye — This former Cadet played a major role in helping Coach Eric Huck’s team reach the regional final last season. The 5-11, 190 pounder ran for 1,805 yards and 37 touchdowns last season, which followed a 987-yard junior campaign. He was named all-PVC three times, all-OVAC three times and twice to the all-Ohio squad. Casey, who plans to attend Marietta College, is the son of Chris and Karri Lewis of Beverly. AUSTIN MAYFIELD, East Liverpool — This former Potter put up some huge numbers in helping to lead Coach Josh Ludwig’s team. The 6-2, 205 pounder finished with 2,861 yards passing and 19 touchdowns. He ran for 881 yards and 13 more touchdowns during his career. He was also the Potters’ punter. Mayfield, who owns all of East Liverpool’s passing records, was named first-team all-Eastern District and second-team all-Ohio. He was all-OVAC and second-team all-Valley. Mayfield, who plans to attend West Liberty, is the son of Jim and Billi Jo Mayfield. KONNOR ROBERTS, Meadowbrook — This former Colt had a brilliant career for head coach Jeff Twiddy’s team. The 6-0, 180 pounder threw for 1,970 yards and 20 touchdowns. He was named third-team all-Ohio as a junior and second-team this past season. He was also twice named to the all-OVAC and all-ECOL teams. Along with football, Roberts played basketball and baseball. Konnor, who plans to attend Ohio Dominican, is the son of Tony and Shelley Roberts of Byesville. MAX TICE, Toronto — This former Red Knight was a go-to-guy for Coach Eric Meek’s squad last season. The 5-10, 185 pounder ran for 735 yards and 12 touchdowns, while averaging 8.5 yards per carry. He rushed for 788 as a junior. Defensively, Tice shined at linebacker, accumulating 68 tackles and picking off two passes. He also recovered two fumbles. Tice’s fine seasons didn’t go unnoticed. 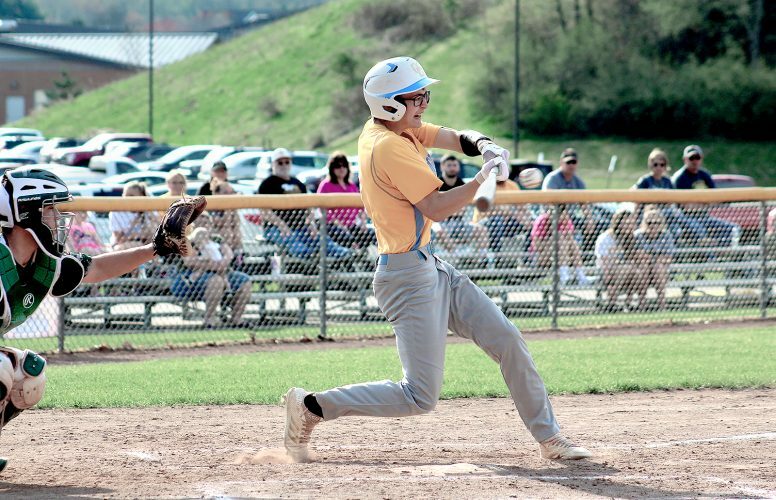 He was named all-Quad County, all-Eastern District, all-OVAC and honorable mention all-Ohio. Max, who plans to attend Marietta College, is the son of Jorjanna and Jim Vasteenberg of Toronto.